Moussa Sissoko has said he hopes to leave Newcastle United "for a bigger club one day" and "Arsenal has always been the club of my heart". The 25-year-old has won over St James' Park die-hards this season with a string of eye-catching performances and fits the bill of the dynamic midfield powerhouse who Arsenal supporters crave. The former Toulouse favourite took to social media last week to urge Magpies fans not to believe reports he was actively looking to leave the club now that manager Alan Pardew had left. But the Mali-born France international revealed he has his heart set on a big club to fulfil his desire to play Champions League football. 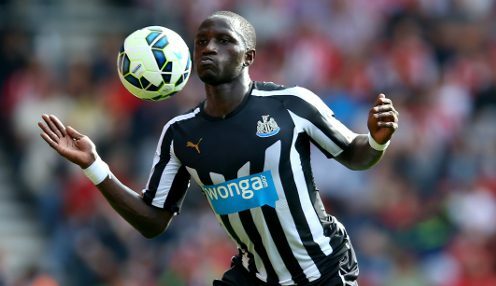 Sissoko told French TV show Telefoot: "The transfer market is open, so things can happen any day, but I am focused on Newcastle. "If anything should happen, it will. I hope I'll leave for a bigger club one day. England is my priority." Newcastle paid only £1.7million to bring the midfielder to St James' Park two years ago but could now command a big fee for the player. Sissoko said Arsenal are the club of his choice and revealed he would find it hard to turn down a move to Emirates Stadium. He added: "If Arsene Wenger calls, I'll have a man-to-man discussion with him and then we'll see. Arsenal has always been the club of my heart. "I hope I will improve to win the Champions League one day." Newcastle United are currently priced 1/1 to finish in the top four and 1/1 to end the season in the top half of the table.